Steam is cross platform gaming service that available for Windows, Mac and Linux, developed a by company called Valve. You can find both free and commercial games that can play on Ubuntu via Steam client and It is the most convenient way to install and play games on your Ubuntu 18.04 desktop. Following are the steps to install steam in Ubuntu 18.04. Download Steam for Ubuntu 18.04: Go to steam download page and download the stem deb package for Ubuntu 18.04. Install the steam deb file: Right click on the deb file and select: "Open With Software Install", then click on the install button. Open Stem for the first time: Now go ahead and open the steam client from the Ubuntu application menu. 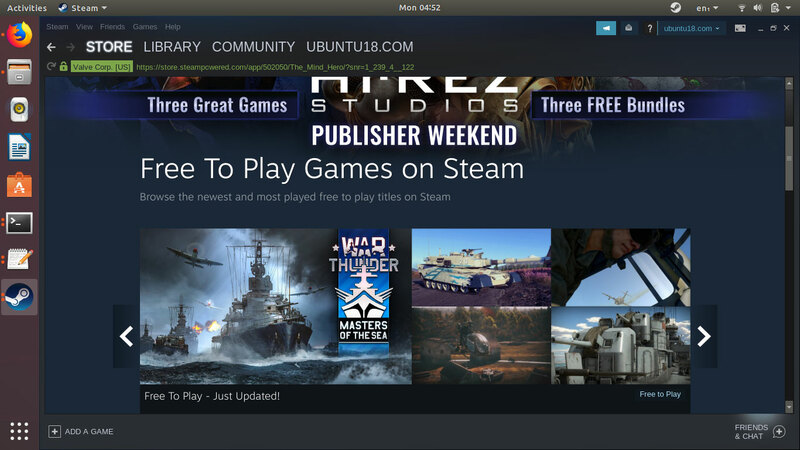 Once you install Steam on Ubuntu 18, you'll be able to find a number of free and commercial games designed for Linux Ubuntu.